St. Bernard of Clairvaux (1090 – August 21, 1153) was a gifted holy man of France. Bernard was an Abbot, a monk, a Theologian, and a poet. He was one of the greatest spiritual masters of all times. He had a special devotion to the Blessed Virgin, and there is no one who speaks more sublimely of the Queen of Heaven. He was also the most powerful propagator of the Cistercian reform. Bernard was a very wise man that the Pope commissioned to lead the Second Crusade. He helped end the schism of anti-Pope Anacletus II. St. Bernard founded and led the monastery at Clairvaux which had over 700 monks, and he was proclaimed a Doctor of the Church by Pope Pius VIII. St. Bernard was born in a castle, the third of seven siblings into the highest nobility in Burgundy, France. His parents would send him for the finest of educations. At the age of nine years, Bernard was sent to a much renowned school at Chatillon-sur-Seine. He had a great taste for literature and devoted himself for some time to poetry. His success in his studies won the admiration of his masters, and for his growth in virtue. Soon after his mother died in 1113, Bernard decided to enter the monastery of Cîteaux at the age of twenty-two. The Benedictine monastery was in dire condition and declining enrollment, going three years without any new monks. When Bernard explained his intentions to his family, they were appalled at the lifestyle he would be entering. St. Bernard had persuaded four of his brothers, one uncle, and 26 other men to join him. By his third year, 1115, he became Abbot. As a young Abbot, he published a series of sermons on the Annunciation. These marked him as one of the most gifted spiritual writer. He would create many more monasteries, including Clairvaux. The influence of the Abbot of Clairvaux was soon felt in provincial affairs. St. Bernard defended the rights of the Church against the encroachments of kings and princes. The death of Pope Honorius II occurred on the 14th of February, 1130. This event would lead to a schism whereby two Popes would be elected. It cost Bernard eight years of laborious travel and skillful mediation. At the same time he labored for peace and reconciliation between England and France. King Louis le Gros convened a national council of the French bishops and was chosen to judge between the rival popes, Innocent II and Anacletus II. The King chose Innocent II. Bernard sided with Innocent II, who had originally been one of his monks, and against Anacletus at the Council of Reims. In 1132, Bernard accompanied Innocent II into Italy, and at Cluny, the Pope abolished the dues which Clairvaux used to pay to this celebrated abbey—an action which gave rise to a quarrel between the "White Monks" and the "Black Monks" which lasted twenty years. Pope Innocent passed away and new Pope was elected in 1145. The First Crusade had given the Christian forces control of a few areas in Palestine, including the city of Edessa. Muslims had been conquering these lands. King Louis VII of France was eager to launch a crusade to retake Edessa and prevent a Muslim recapture of Jerusalem. He sought Bernard's approval, which he refused. He then asked the Pope to order Bernard to preach a Crusade. The Pope gave the order, and Bernard preached with spectacular results. At Pope Eugene III's command, Bernard traveled through France and Germany preaching the Second Crusade to send vast armies on the road toward Jerusalem. He aroused the greatest enthusiasm among the masses of the population. As for the Crusade, things went wrong from the start. The various rulers leading the movement were distrustful of one another and not disposed to work together. Of the soldiers who set out (contemporary estimates vary from 100,000 to 1,500,000), most died of disease and starvation before reaching their goal, and most of the remainder were killed or captured soon after their arrival. The impact on Bernard was devastating, and so was the impact on Europe. In 1153, the passing of Pope Eugene had struck the fatal blow by taking from him one whom he considered his greatest friend and consular. The entire responsibility for the Crusades failure rested on Bernard. He was blamed for not providing miracles for victory, which he attributed it to the sins of the Crusaders. Bernard journeyed to reconcile the warring provinces of Metz and Lorraine. He persuaded them to peace and to an agreement drawn up under his mediation. "On the Canticle of Canticles". St. Bernard explained in eighty-six sermons. 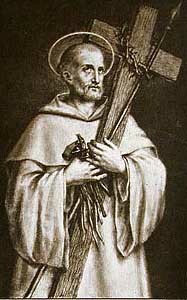 St. Bernard died at Clairvaux on 20 August 1153. He was canonized by Pope Alexander III on 18 January 1174. Pope Pius VII declared him a Doctor of the Church in 1830. St. Bernard appears towards the end of Dante's Paradiso, acting as Dante's guide for the final stage of his journey towards God.